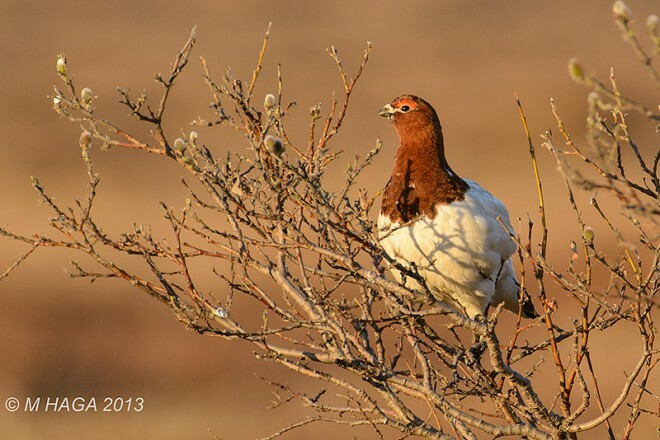 Willow Ptarmigan near Nome, Alaska, by mayhaga. 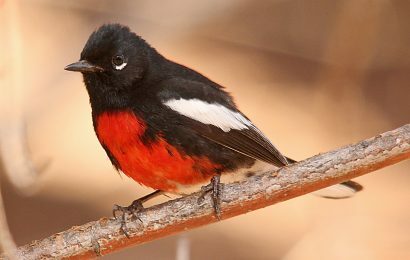 Whether a bird spends the winter in high latitudes or migrates to more southerly climes in fall has less to do with temperature than with food availability. Given a reliable food supply, birds can usually cope with the cold. As tempera­tures drop, birds can generate heat by shivering, but this is a temporary fix that requires a stepped­-up metabolism and increased food intake. For the long term, passive mechanisms are preferred. One adaptation for heat conserva­tion is size. 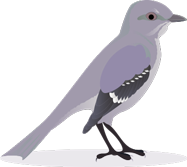 Birds of northern regions tend to be larger than similar birds from temperate zones. Bigger size gives birds a smaller surface­-area­-to­-volume ratio, so less body mass is exposed to skin and, therefore, less heat is lost. 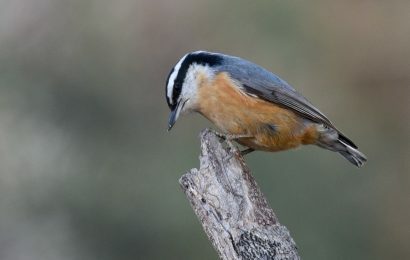 Larger size also increases a bird’s fasting ability. 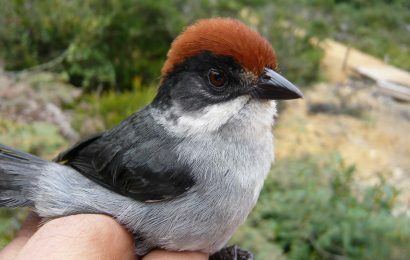 Examination of House Sparrow survivors and victims of severe winter storms in Rhode Island in 1898 and in Kansas in 1978­-79, for example, revealed that larger males were favored to survive in both cases. Another adaptation is the number of feathers: Northern birds have more feathers in their winter plumage than in their summer plumage — both down and contour. The overlapping contour feathers hide a dense layer, closer to the skin, of loose down feathers that trap air, an excellent insulator. Sometimes, in really cold weather, birds puff out their feathers to increase the amount of air next to the body. Birds protect their eyes and bill by tucking their head under the scapulars, the packet of feathers on the shoulder. Doing this also allows birds to breathe warm air. But what about legs and feet, which are not covered by feathers? The legs of a few Arctic birds, such as the ptarmigans (pictured above) and Snowy Owl, are feathered all the way to the toes, but on most birds, the lower leg, toes, and web are bare. See Snowy Owls photographed in the winter of 2014-15. The lower leg, the tarsus, is a single bone, the fused remnant of the meta­tarsals of the arch and ankle bones. It connects on top with another bone, called the tibiotarsus but known to many of us as the drumstick. Its lower part is usually bare, while the upper part is packed with muscle. In cold weather, blood moving through the naked portions of the leg could lose enormous amounts of heat, forcing birds to compensate by produc­ing similar quantities through metabo­lism (eating) or muscular activity — probably more than they could sustain, creating an impossible situation. The problem is that blood that is warm when it leaves the body will be cold when it returns to the body. 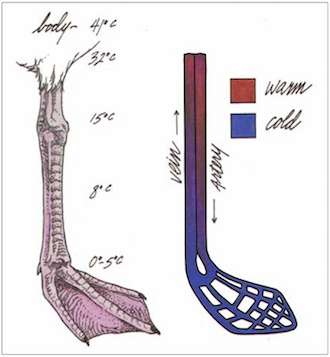 FROM COLD TO WARM: Two views of a gull’s leg show how heat is exchanged between blood vessels. Art by Michael McNelly (after Ricklefs. 1990. Ecology. W.H. Freeman, New York). The solution is a countercurrent heat-­exchange mechanism. Described simply, the main artery that carries warm blood down the leg is positioned next to a large vein that brings cooler blood back from the foot to the body. A shunt near the base of the toes allows most of the arterial blood to pass directly into the vein and return without going through the toes and webs and losing even more heat. The venous blood absorbs heat from the warmer arterial blood next to it. As the venous blood continues toward the body, it comes in contact with even warmer parts of the artery, so heat is exchanged all the way from the bottom to the top of the leg. In fact, the vein and artery do more than lie side by side: The vein branches into a network that surrounds the artery, thereby increasing the surface area in contact with it and maximizing the heat exchange. Consequently, blood arriving back in the body is only slightly cooler than what originally left to go to the legs. Some of the blood at the bottom of the leg bypasses the shunt and runs through a capillary network in the toes and web. Then it passes through a smaller vein, rejoins with the larger vein, and returns to the body. The tempera­ture of the blood in the web has been recorded at a few degrees above freezing. Theoretically, the blood could be below 0°C since chemicals in the blood can depress the freezing point. Birds’ countercurrent heat-­exchange system is not unlike systems used in industry, except it is more efficient. The dry, scaly covering of birds’ legs and feet prevents the skin drying and tissue damage that we would experience in cold situations. This, plus the countercurrent system, allows gulls and ducks to stand on ice for extended periods without apparent hardship. If temperatures drop far below zero, however, the birds would need to produce extra heat. 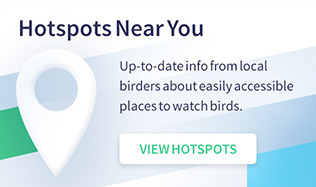 Most of the time, birds inhabiting northern climes handle the cold quite well. After all, if they didn’t have adaptations to survive beastly low temperatures, northern winters would indeed be birdless and bleak. Methods for surviving extreme cold, including the countercurrent heat exchange, are examples of the amazing structure and behavior of birds. 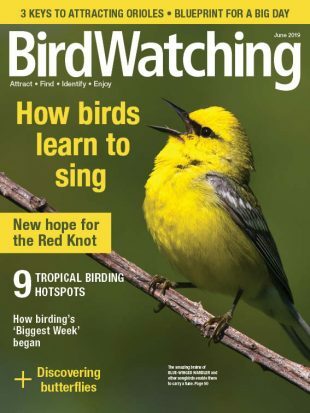 This article from Eldon Greij’s column “Amazing Birds” appeared in the March/April 2015 issue of BirdWatching. The amazing way birds land. Why birds have no teeth and sometimes eat pebbles. 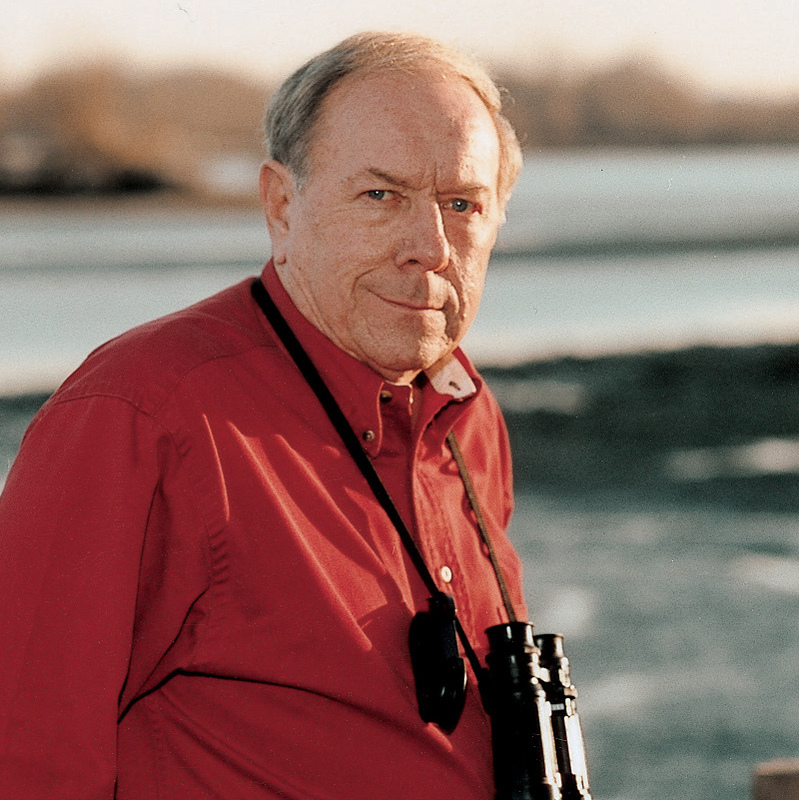 What every birder should know about bird poop. Bird’s varied and surprising mating strategies. The amazing way birds breathe.